At this leather flower workshop participants will go through all the stages of the process of creating flowers from the leather. This will include preparation of materials, making patterns, dying materials, assembling and finishing techniques. 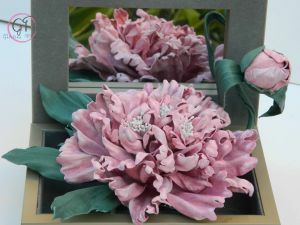 Students will learn how to work with a wide range of Japanese style flower making tools. Students , depending on their progress could choose to make various roses, including old English rose, chrysanthemum, poppy, clematis, dahlia, orchid, sunflower, , peony, magnolia and other flowers. All these flowers are very distinct and in making them students have to use various elements of flower making technique. They will learn how to modify existing patterns and design their own flowers. The number of students will be strictly limited to make sure that it is a great learning experience. The duration of the class is 6 hours, cost is $175, it includes lunch and materials. For my constant students the cost is $150. To secure your place a deposit is required.